Elle of Feeding My Enthusiasms and Deborah of Taste and Tell, two blogs I totally adore, picked something quite playful and adorable for this month’s Daring Bakers – cheesecake pops from Sticky, Chewy, Messy, Gooey by Jill O’Connor. Elle and Deborah gave us quite a bit of leeway in customizing our pops, which I’m sure has resulted in a dazzling display of creativity among all the Daring Bakers. For my part, I found this recipe an opportunity to play with an interesting new addition to my pantry: pandan leaves. Pandan leaves, or screwpine leaves, as they as also called, come from Southeast Asia, and are used in a variety of ways, from flavoring savory dishes to scenting jasmine rice. Pandan possesses a uniquely nutty, floral flavor, quite unexpected from the leafy green fronds. This subtle sweetness also makes pandan a natural for baking: one classic dessert is pandan chiffon cake, a fluffy, angel-food like concoction distinguished by its spring green hue which comes from the pandan leaf juice itself. So where are pandan leaves found outside of Asia? Surprisingly, they were almost under my nose – frozen pandan leaves are often carried in Asian supermarkets, and I actually found fresh ones in Chinatown! Another reason why I love living here – there’s always something new to uncover. If you can’t find pandan leaves, there is also pandan extract and pandan paste – in fact, many recipes will often call for these substitutes instead. Having found both at the supermarket, I purchased them to do a little comparison baking in the kitchen. Onto the recipe itself: I must confess that this was not my favorite recipe. The cheesecake was easy enough to make and set nicely, but I had difficulty forming it into balls for dipping. The cheesecake was a little too soft to work with, although I think it was an excellent texture for cheesecake: if I had baked it longer, I think it might have turned rubbery. So it was a good cheesecake, but I just had trouble getting it into its final form. Dipping the cheesecake balls in melted chocolate proved not too tricky either, but I think these pops might store better in the freezer than the refrigerator. Storing them in the fridge kept the cheesecake centers a little too soft so the wooden skewers did not stay in very securely. Ultimate verdict: this is a nice recipe, and very nicely adaptable, but I think I enjoyed it more for the chance to experiment with flavors than actually making them. In working the pandan leaves, I wasn’t convinced at all initially that these long leaves would actually work as described. They had a grassy smell (naturally), and after blending them with some water to get pandan juice, it still smelled grassy – and tasted that way too. I was certainly glad I had some pandan extract at this point! I added the juice to half the batter, which fortunately did not change color – I was afraid I’d be breaking the challenge rules! Apparently it takes a lot of pandan juice to add color to a dish – many recipes call for food coloring or pandan paste in addition to achieve the verdant hue. Pandan extract and pandan paste usually have food coloring that will most certainly turn whatever they’re added to quite green! Tastewise, I had yet another surprise. Both cheesecakes tasted very similar. I was so certain the one with pandan juice would taste grassy, but in fact it somehow transformed in the oven into a smooth, creamy cake with an elusive, sweet flavor almost like a floral vanilla – and it no longer smelled like grass. The cheesecake with pandan paste tasted a little stronger, perhaps because of the amount of paste I added, but the flavor itself was quite close. What a pleasant discovery! So I can recommend using pandan extract or paste if you can’t find leaves, as the results are close enough to be indistinguishable. I’ve almost used up the leaves, but the paste will last me a long time – and now I’m curious to keep playing around with this intriguing new flavor! Thanks for another fun Daring Bakers Challenge! In a large bowl, beat together the cream cheese, sugar, flour, and salt until smooth. If using a mixer, mix on low speed. Add the whole eggs and the egg yolks, one at a time, beating well (but still at low speed) afte r each addition. Beat in the vanilla and cream. very very interesting… I’m intrigued by the flavors! I’ve never tried pandan leaves. This sounds delicious! I have never tried pandan before – you are so creative!! Great job on this month’s challenge! They look lovely. I thought at first your green centered one was mint. You got the chocolate coating very glossy. Really interesting in how you flavored your pops and I love the green color! These are so pretty! The green is gorgeous! Great job! Oh, wow, Anita! I love your blog because I’m always learning about new flavours and ingredients! Your pops are so elegant and pretty! I’ve beening looking for pandan leaves for like a year locally! So jealous-this looks great. Very cute pops! I do love the color that the pandan paste produced, but I have to admit, I would think it was mint by the looks of it. Very pretty! So interesting to read about the pandan leaves. I had the same problem with it being a bit soft to form into perfectly round balls, but yours look delightfully round! Beautiful! Your cheesecake pops look amazing! How did you get them to come out so round? Mine look more like meatballs! How fab. I need to find some pandam leaves as I’m seing them all over. Very innovative to use in Pop.I think a visit ti China town is in order. Oh wow…Your pops look gorgeous! I have not been able to try it..but it sounds lovely. Wow — good for you for trying pandan leaf. I’ve never tried it (knowingly), but I am very intrigued. Anita, thanks for all your truly interesting information. I had no idea about pandan leaves, but have been reading about banana leaves which evidently can also be purchased frozen! I agree that storing these frozen is best, and eating right from the freezer is perfect. Gorgeous photos, and a great post as always. Cheers! Thanks for the info on fresh pandan leaves vs. extract. 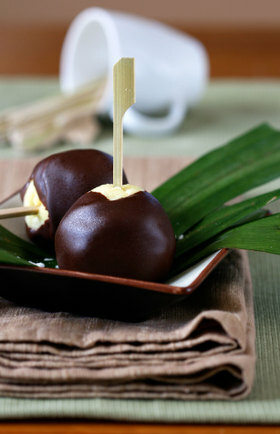 I like how you incorporate Asian flavors into your desserts and make your cheesecake pops with bamboo skewers to match the theme as well … they look cute! I’ve seen pandan in recipes a lot lately – I am glad to hear that I can seek it out in my asian market’s freezer section!! Anita, you’re such a trooper for doing that experimental comparison 🙂 This is the second post I’ve read about pandan (another from HolyBasil) and I’m so intrigued! I love subtle tea/grass flavors. I will have to try and get my hands on some one day. Your pops are gorgeous just like everything you make. You have the magic touch, lady! Wow, the colour on the second one is gorgeous. Perfectly done pops! Thanks for the info about pandan — I’ll look for it in the Asian market. Definitely the most unusual flavor variation I’ve seen for the cheesecake pops! What a great idea to try the pandan leaves. It sounds like your experiment turned out well, and yoru pops look delicious! great use of pandan here. In South East Asia, the flavor of pandan is usually paired and enhanced with coconut milk. Ya’ll keep tauting me with pandan leaves…another delicacy I have yet to find here (never!). You did a fantastic job with them, they look super classy! Never had that ever(pandan leaves that is). Way to come up with a new flavor. What a wonderful twist on this challenge! Well done! Those cheesecake pops look awesome! I used to eat pandan chiffon cake all the time when I lived in Singapore…yummy! Can’t believe you found the fresh leaves…I’ll have to look around for them. very clever interpretation – nicely done! What a fun take on the challenge! And I learned a new ingredient to boot… thanks!! Having never heard of pandan before, I would never have even dreamed of this combination. But it sounds incredible. It’s funny how you can never hear about something for the longest time and then as soon as you see it once, it seems to be everywhere. Such is the case with me and pandan lately. I still have not tried it, but it’s popping up everywhere! Your pops are stunning as usual. i had some trouble getting the cheesecake into balls, too, but yours look like perfect spheres to me! pandan sounds really interesting…i will keep my eye out for it (in whatever form) the next time i go into chinatown. Beautiful shiny chocolate. Clearly you know what you are doing. Those look amazing. They certainly LOOK pretty! I thought they were a bit precarious to make, but I loved the result. I agree- the freezer is best for storing for sure. Kudos to you for trying something really different! I love the hue of that green! Excellent job, and way to go with the experiment. They look awesome, and it sounds tasty! They turned out nicely. I have been seeing a lot of different recipes calling for Pandan leaves – we live in San Francisco as well, where do you get them? Better yet, where do you get the paste, sounds like that may be the way to go. The use of pandan is simply brilliant! I adore pandan and I must say I always forget about thing I want to try. Only when my baking project is done will I remember (and regret) not trying out cool, funky flavor combos. Great job! I love the green hue to the paste pop. It looks amazing. I love the taste of pandan…now to look for it at the Asian market. Your pops look lovely!! Oh wow! i love the experimenting with flavors. i was thinking of matcha cheesecakes. anita – these are gorgeous! How ingenious! Pandan flavored pops. We just got back from a trip to Malaysia and ever since I’ve been trying to recreate some of the food we ate there and pandan leave have been a bugger-boo to find. I may have to ask at some of our local Asian market, maybe I’ve just been overlooking them. Nice looking pops! The green cheese cake looks really good. Interesting and creative! I love what you did with this month’s challenge. how clever. the pandan leaf flavor sounds so interesting. so good to read about a new ingredient. fabulous ! Pandan huh! Great idea! I have a pandan plant growing in my backyard!! Thanks so much for the comments – it’s so fun being a DB! As for questions on where to get pandan leaves/extract/paste, they are mostly grown in southeast Asia so you may want to check out your local Asian/Chinese/Vietnamese groceries. Fresh pandan leaves are probably harder to find as they don’t last very long. It’s easier to find frozen leaves, pandan extract (or “essence”) or paste – I’ve seen them sold online as well. If you live near San Francisco, New May Wah supermarket on Clement has fresh pandan leaves and also carries the paste and extract, as well as an amazing selection of Asian ingredients – check it out! 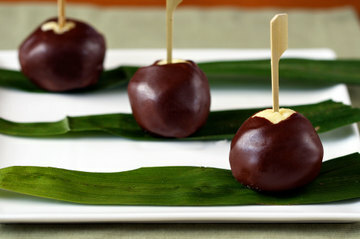 Your cheesecake balls are simply beautiful. Thank you for describing your exploration of pandan leaves and paste. I haven’t had a chance to try it out and now I’ll definitely have to see if I can find some to experiment. I’ve just recently discovered pandan myself and have poached pears with pandan and made a pandan ice cream. 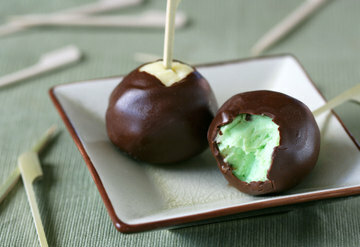 Your pandan cheesecake pops look awesome! That sounds incredible and is the most individual pop creation I’ve seen! The green pops look really pretty! Wow! I’m amazed at the quality that everyone has done on there cheesecake lollipops. My wife is planning on making yours for her staff at work. They look so good!